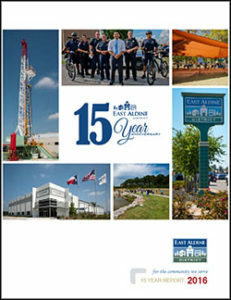 In 1998, East Aldine was a nearly forgotten semi-rural, unincorporated area with high crime, limited county services, aging infrastructure, inadequate utilities, and virtually no sidewalks. Concerned business leaders, along with community and strategic partners, unwilling to accept the idea that nothing could be changed, lobbied state officials to assist with legislation to create an improvement district. In 2001, they were ultimately successful in getting legislation passed which created the East Aldine Improvement District. Finally they had the governmental framework needed to begin the next phase of their journey, and what a journey it would be.